According to Professor Sonia Blanford, 1 in 6 children lives in poverty in Britain today. Pupil premium is the government’s strategy for assisting students who are disadvantaged by poverty by giving schools extra funding to help remove any barriers they face. In the 2018 to 2019 financial year, Selly Park will receive £935 for each child who has been registered as eligible for free school meals at any point in the last 6 years. How many students at Selly Park are currently eligible for the Pupil Premium? 335 students are currently eligible for Pupil Premium. Therefore, the school received £371,195 in four instalments the last academic year £935 x 397 students = £313,225. How much Pupil Premium did the school receive the previous year? In 2016/2017, the school received £353,000. What if I am a carer and my child is adopted? Adopted children are entitled to enhanced funding. Please contact the school and let us know this vital information. Your call will be treated with the strictest confidence. How can I ensure my daughter(s) receives the Pupil Premium if they are eligible? If you qualify for any of these, please contact the School. 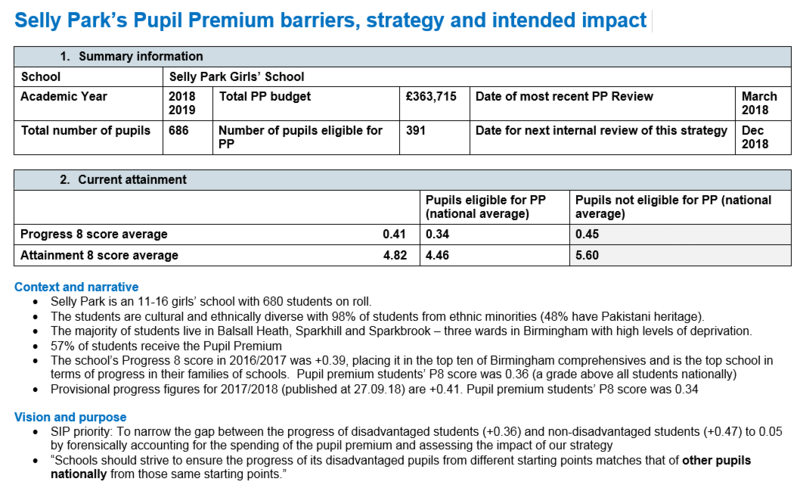 Who is responsible for the spending of Pupil Premium at Selly Park? Why is the Pupil Premium so important? Selly Park’s second pillar is aspiration students. The School’s aim is to expose our students to as many opportunities as possible, ensure they receive excellent teaching from inspirational teachers and imbue a ‘can do’ attitude. Any financial barriers that exist should be alleviated by the premium; students who receive it should have the same opportunities as their peers. Selly Park wants all students to fulfil their potential, enjoy school and achieve the highest grades possible. There may be barriers that prevent students from doing so. It is the role of senior teachers at Selly Park to identify any barriers that exist. These barriers vary from student to student. It is important to note that some students who receive the Pupil Premium may experience no hardship at all, experience no barriers and may attain very highly. 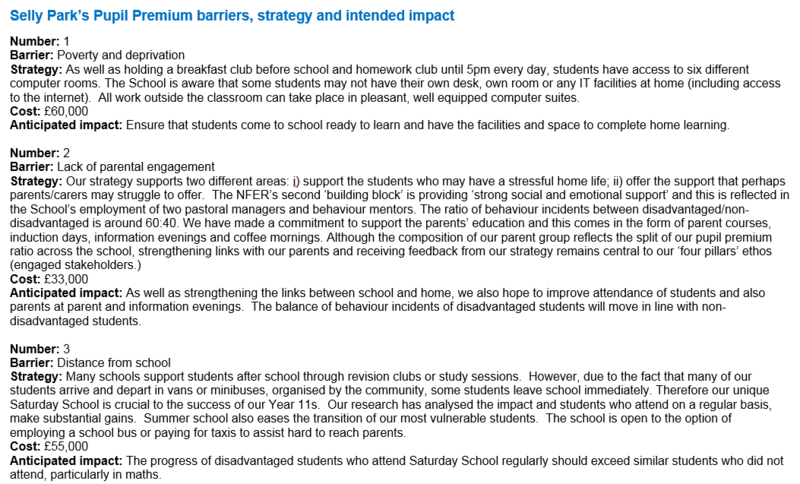 Please see the attachment below to see the specific barriers that some Selly Park students face. Once senior teachers have identified that barriers to aspiration, they then form a pupil premium strategy to remove these barriers. For example, a student may be the first in their family to have the opportunity to attend university. If this was a barrier, the school has a duty to educate the student about university, give her advice about the application process and entry requirements. This may involve paying an external careers advisor to do this. In addition, the school could arrange a visit to a local university. 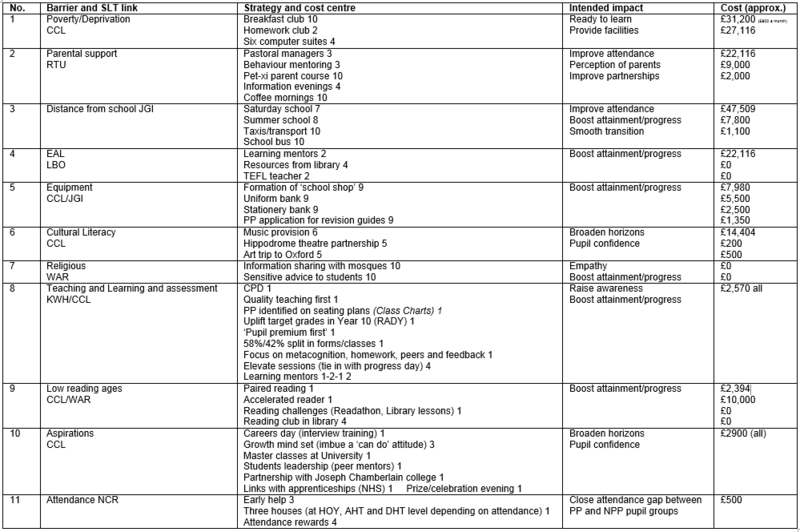 All this could be paid for by the pupil premium. Click on the attachment below to see the strategy we have adopted at Selly Park. Selly Park’s success criteria will use both quantative (hard data that can measured) and qualitive data (soft data where the effects are less tangible). Examples of quantative data (hard data that can measured) may be students’ achievement in a particular subject, of their destinations after leaving Selly Park and the number of extra curricular trips they attended. Examples of qualitative data (soft data where the effects are less tangible) may include feedback in pupil questionnaires, student council meetings, form discussion, PSHEE lessons, feedback, anecdotal evidence and successes outside of school. We evaluate the impact of our strategy in a range of ways. Senior teachers in charge of pupil premium (Mr Gibson and Mr Clinton) meet on a monthly basis. They will feedback their findings to Mrs Darwood (Head Teacher). 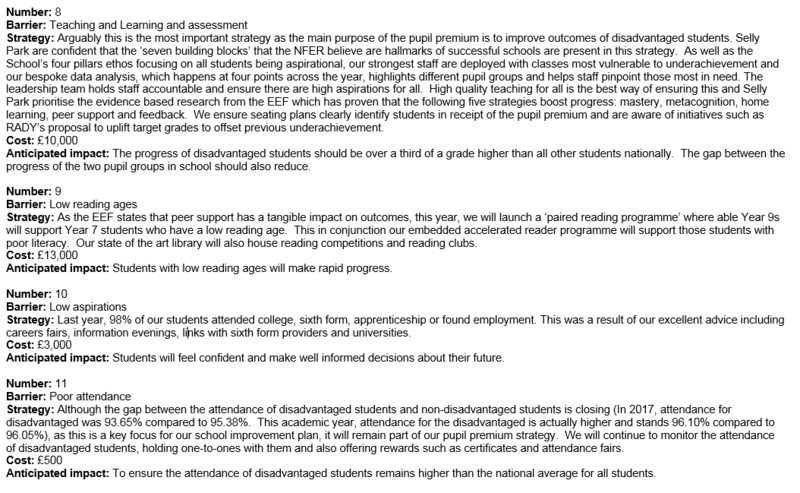 They will mainly focus on the impact of Saturday school, bespoke additional activities and achievement data. Link governors are informed on a bi annual basis and the full governing body will be informed on an annual basis and the strategy will be set for the following academic year. Teachers will receive training about our Pupil Premium Strategy in their Tuesday CPD sessions. Heads of Department receive data about the performance of pupil premium students three times a year. In rigorous department reviews, they are expected to explain the extra support disadvantaged students have received. 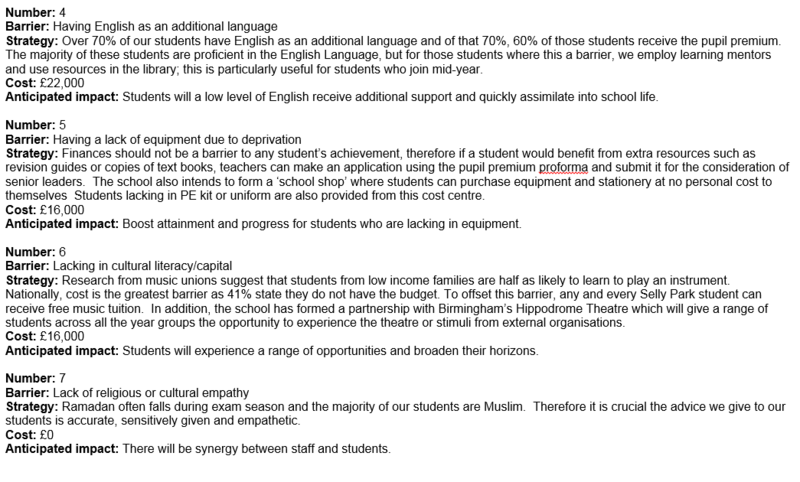 Teachers can apply for pupil premium grant via Mr Gibson. In the last academic year, Achievement for All conducted a short review on 1st March 2018.